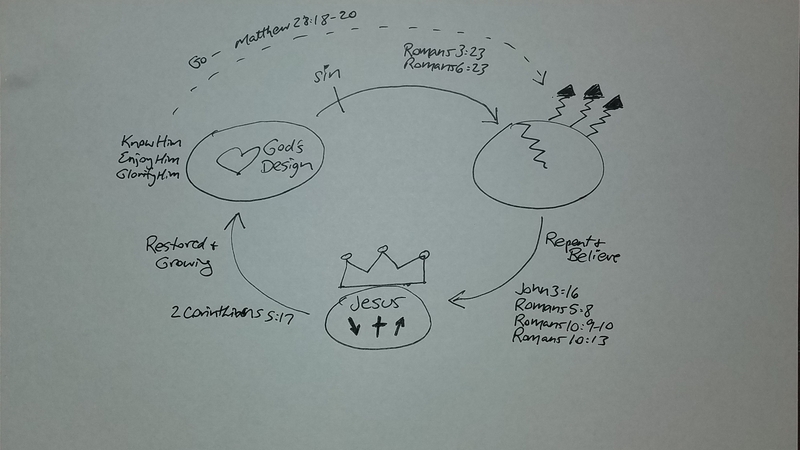 One approach to explaining the gospel of Jesus is by drawing a picture commonly known as the Three Circles. Followers of Jesus around the world use this picture to help people realize the eternal difference that Jesus can make in their lives. Our world is broken, and people try many things to escape the brokenness. Unfortunately, like a bungee cord, brokenness keeps pulling us back in. The world is broken because of sin. Brokenness was not God’s original design. God’s original design was that we would know Him, enjoy Him and glorify Him forever. He made us to experience His love. Knowing that we live in a broken world, God provided the way for us to be fully restored to Himself. Jesus came down from heaven, died for us on the cross and rose again on the third day. He is alive forevermore and He offers salvation to everyone who will repent of their sin and believe in Him. When we acknowledge Jesus as the king of their lives, He not only restores us to right relationship with Him but He also helps us to grow as followers of Jesus. And, He calls us to go back into the broken world to tell others the good news of Jesus. There are many online videos of people sharing the Three Circles if you’d like to watch them to receive training on how to share the gospel using this evangelism tool. You can find them on Vimeo or on YouTube. My encouragement to you would be to practice, share with a friend or family member, and pray that God will give you opportunities to share this picture with someone who doesn’t yet know Jesus as Lord and Savior. How amazing that a picture using three circles can help lead someone to saving faith in Jesus Christ!